So California has rain and we have sun…Hooray. I suppose. The fearful mudslides may now materialize in CA, but I hope not. We had a smidgen more snow yesterday…all gone today. I added a new weather APP to my iPhone so I know the weather report faster than ever…as if I can’t look out the window. APP #1 was stuck on Austin Texas for a while but now on Washington DC where it should be. APP #2 is still stuck on NYC, but I expect it will sort itself out soon. I also downloaded a local county APP which looks promising….See a tree down, report it, need snow removal report it. You might say I am APP Happy. 1/ Bridge Over the Drina, a work of fiction about Yugoslavia by Ivo Andrić who won the Nobel Prize for Literature. 3/ Bosnia and Hercegovina: A Tradition Betrayed, by Robert Donia and John Fine, professors of history at Michigan. I want to read Tuchman’s Guns of August and Samantha Powers Problem from Hell. We were assigned the latter in a history class on Human Rights, but I never finished the book. I have both on my Kindle, but won’t return to the latter before the end of the year. I plan to read Tuchman’s latest book The Proud Tower: Portraits of the World Before the Great War in a month or so, and then I may read her book on the Great War in August. I was going to read MacMillan’s 1919 in July, but will put that off until later…maybe 2019? So, am I doing much besides reading and doctor’s appointments? Not really. I had my quarterly blood draw yesterday and see my bone surgeon tomorrow. The phlebotomist noted, “Unlike the ninety-nine percent of my patients who look away when I draw blood, you don’t.” Blood is blood, I said, and I thought to myself, I raised kids, do you know how much blood I saw? Except for mysteries, we don’t watch much TV, and when we do, I am usually crocheting my new Afghan, not looking at the TV. I sorted out my yarn two nights ago and sent Hannah a box of miscellaneous skeins today. I suppose I am a homebody these days, and I like it like that. Tomorrow’s dinner = fruited pork roast from the new weight watchers cook book. I’ll get it into the slow cooker before I see my bone surgeon. This entry was posted in Books, Cooking and Food, Elder Blogger, Health/Medical Stuff, History/Art History, Retirement Living, Urban Spaces by SchmidleysScribblins. Bookmark the permalink. Here in the UK’s North West, we’ve been very fortunate with our weather – some rain, but no floods; no snow; mild temperatures. I see our winter took a vacation in your part of England. I am no fan of Washington summers, but our winters are usually quite nice. You can take the Jet Stream back now! 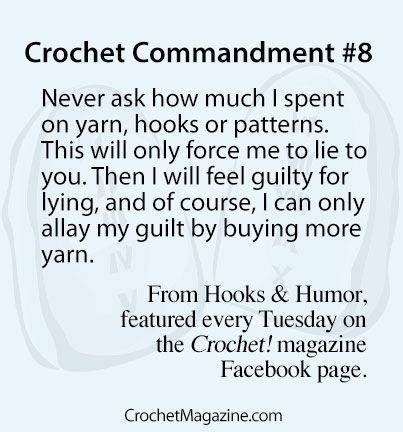 Your crochet commandment makes crocheting sounds a bit like gardening! I have four weather links at my fingertips, but no matter which one I check, the weather is still too cold and wintry. And you have more coming your way. Hope it misses us! I like being a homebody, too. 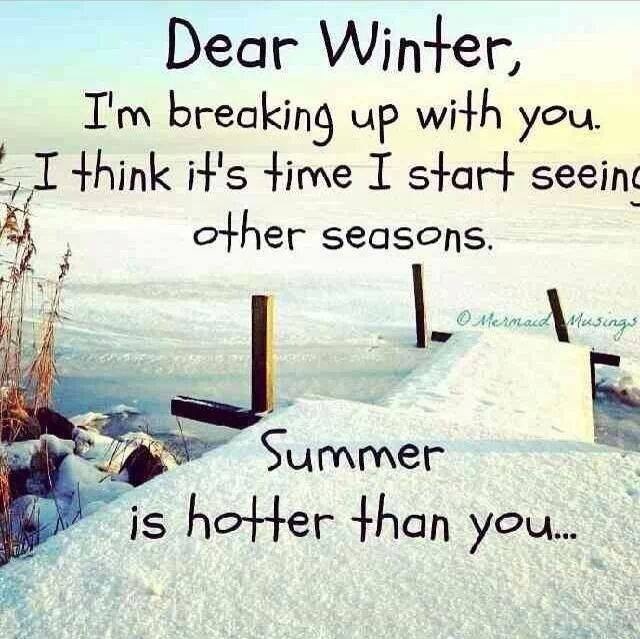 🙂 Loved that image about breaking up with winter. Too funny! It all sounds perfect to me. I didn’t know Tuchmann was still writing. (Oops, she isn’t, because she died a long time ago – I just looked her up) I only read two of her books. I just got the the Gutenberg Project app and have been reading ‘Historia Calamitatum’, Abelard’s litany of the ills done him. The letters are next. An unlikely reading matter but as a filler in between thrillers and literary tomes this works fine. I hope the sun will shine for you. Abelard. I visited his grave (with Heloise) in Paris. Yes he was wronged, and did much to reform the church thereafter. Perhaps the books are new to Amazon? I know she won a Pulitzer for Guns of August. Love the joke, love the history book about “The Haunted Land.” My friend DeAnna is teaching in Prague and very worried. Yes, not warm and sunny here. Now I am curious, why is she worried? Winter just refuses to leave you, doesn’t it? I believe I’m at the point where I’m overly APP happy. Have a great weekend! By the way, I still turn away when I’m having my blood drawn, no matter how much blood I’ve seen. According to the phlebotomist, you are in the majority. I’m burying this message to you in an older post because I don’t have your e-mail and I like to keep my trips private… just in case. I’d rather the world not know when we’re gone from the house. We’ll be going to Vietnam, Cambodia, Thailand and then Bangladesh where we’ll spend time with our son who is now working there for Johns Hopkins. I’ve got posts scheduled to go up, but won’t be able to visit until after we settle down again after our return. Take care and stay as warm as you can. It was cool over here today. It was a surprising 60 degrees this morning. I know. I know. My daughter has already told me it’s 20 in Chicago. Reading, cooking comfort food and crocheting – perfect winter activities as we semi-hibernate, anxiously awaiting spring. Yes, I need to keep myself diverted. Have tried biographies but get fed up after all while – no matter how famous some people are their life stories (written by themselves or another) can be very Me Me Me after a while. Fiction along with Travel – Craft – Gardening and Cats are what i tend to gravitatate to these days. Looking at some of the ‘classics’ I wasn’t interested in years ago – read Lord of the Flies (William Golding) last year and thoroghly enjoyed it. I know what you mean about biographies, although I read several for my history courses: Winston Churchill, Baldwin, Thatcher, Lloyd George, etc. lord of the flies- saw part of the movie…awful. I think they ate the fat kid. 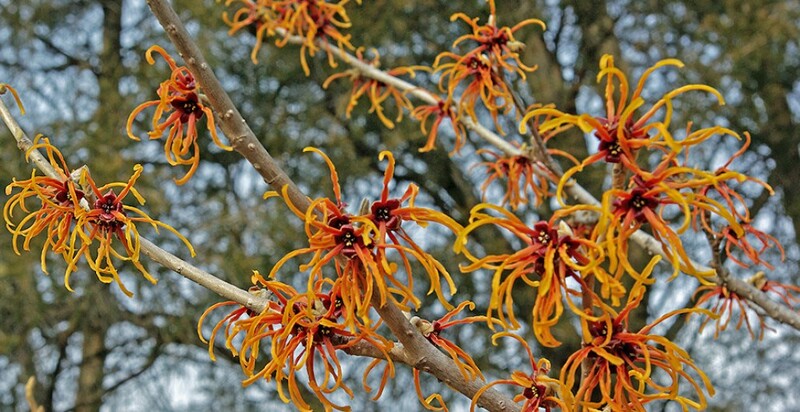 I read many nature and gardening books in the past: John Muir, Henry Mitchell, Allen Lacey, Michael Pollen, etc. The last book on the environment I read was Charles Fishman’s Big Thirst about water conservation. I read much fiction in the past, especially when I was commuting to work on the bus and Metro. I still read some fiction, but only as a respite from history. I get bored with fiction very quickly, then return to history. I had an affair with a Croatian concert cellist. That’s all I’ll say. Lol. Awesome. You should write a book. Oh that’s right, you did!